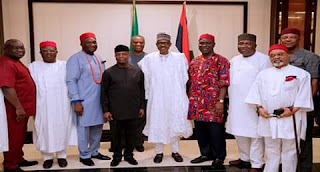 Livinus Agim wrote about the shamefully fruitless meeting of Nnia Nwodo led Igbo saboteurs to Aso Rock. Nobody could have put it any better than this. Read, learn and share. "Buhari is a wise man. He knows they [Nnia Nwodo & Co.] cannot command their people, so he will treat them with contempt. Buhari knows they are beggars, he will laugh at them. They are coming back with shame. If he pity them, he will give them something with oath. Their children should be ashamed of them. They are not honorable. Anything Buhari gave to them has a curse upon it. It is [a] wage of blood. Their reasonable children should not eat from it, least they partake in the after punishment." This commentator encapsulated the futility of the sell out trip by these shameless so called Igbo leaders, that appear to be leading their pockets. No shame, no honour, no class. As usual they came back empty handed. Ohaneze Ndigbo can learn one or two things from Afenifere and Arewa. They never sell their people, no matter the amount on offer. No ministerial positions, no second Niger Bridge, no rehabilitation of roads, the police check points and road blocks are still there. After killing their children to please Hausa Fulani, today Hausa Fulani as usual rejected them. Those people that were killed during Operation Python Dance at the instigation of Ohaneze Ndigbo and Igbo governors, their blood is upon the head of Ohaneze Ndigbo. 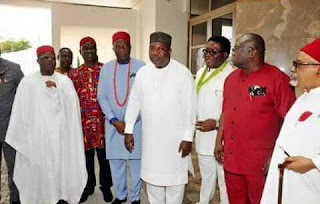 Nnia Nwodo calls himself a leader..... what a shame!